In a masterwork of international adventure, supernatural mystery, and apocalyptic prophecy, New York Times bestselling authors James Rollins and Rebecca Cantrell open the next chapter in a world of shadow and light, of salvation and damnation, where the fate of the heavens is locked within a child of…. With The Blood Gospel, the first novel in the Order of the Sanguines series, James Rollins and Rebecca Cantrell breathtakingly combined science, myth, and religion and introduced a world where miracles hold new meaning and the fight for good over evil is far more complicated than we ever dreamed. In Innocent Blood they again take us to the edge of destruction . . . and into the deepest reaches of imagination. Q. What’s in store for readers in the next book in the Order of the Sanguines series? Q. You now have co-authored two books in the Order of the Sanguines series, how did you decide to join forces? How do two prolific minds work together during the writing process? Jim - Christian is first mentioned in passing in THE BLOOD GOSPEL. Even in that brief reference in the first book, readers were offered a hint that something was different about him. We knew we always wanted to introduce a “younger” vampire into the Sanguinist fold. Rebecca - We introduced the older, more experienced Sanguinists in THE BLOOD GOSPEL. Rhun is hundreds of years old, and his mentor, Cardinal Bernard, has been around at least since the Crusades. Even as they live forward in time, their thought patterns and beliefs are based on a very different world. We thought it would be interesting to show what a modern, irreverent Sanguinist might add to the mix. Christian was turned in the late 1960s, so he’s part of the same century as Erin and Jordan. This drives Rhun a bit nuts, which is always fun to watch. Jim - During the creation of the first book, it was all about world building, creating this landscape where vampires existed and found themselves folded within the cloak of the Catholic Church. It was also about discovering our main characters, how they were going to engage and react. With that all established, we were free to build and expand upon that world and more deeply explore our characters. We initially thought it would be easy, since the groundwork and mythology was already in place, but we quickly learned of a new challenge. Rebecca - The new challenge was figuring out how the characters had grown and changed as a result of the events in the first book. They all had strong personalities, but they went through a lot in their search for THE BLOOD GOSPEL, and they haven’t had time to process it all. Q. In an article published by The Telegraph (UK), fellow suspense writer Patricia Cornwell claims she has uncovered one of history’s best-kept secrets: the true identity of Jack The Ripper. Is there an unresolved mystery that you would like to investigate together? Jim - I always love dabbling into historical mysteries, those pieces of the past that end in a question mark. In INNOCENT BLOOD, we attempted to explain the “lost years” of Christ’s childhood, that gap in His chronology between the Slaughter of the Innocents by King Herod and Christ’s appearance as a young teenager. Where was He before that? Why that gap in Christ’s history? During our research into this topic, we uncovered many suppositions and tantalizing hints. That’s what I love best about digging into the past (something I think our main character Erin shares): that continuing quest for the truth. Rebecca - Jim’s right. I tend to be fascinated by ancient mysteries—the Ark of the Covenant, the Holy Grail, the Voynich Manuscript—and how people have been affected by their quests for knowledge about these objects. Q. In INNOCENT BLOOD and its prequel, THE BLOOD GOSPEL, you introduced elements of a ‘mystical and otherworldly’ nature: religion, Scriptures, apocrypha, angelology. Has anything in your research completely shocked you and changed the way you thought about religion or spirituality? Rebecca - I was surprised by how easy it was to create the Sanguinist/strigoi mythology by using references to existing religious documents. I don’t think there is a vampiric sect in the Catholic Church, for example, but it does dovetail well with many of their traditions: turning wine into the blood of Christ, wearing hoods during the day, rules on chastity. It’s endlessly fascinating. Jim - The basic premise started with a simple supposition: If vampires existed, how might have Christ dealt with such a scourge? How might the early Church have been changed? How might it look today? Rebecca and I attempted to answer those questions, which was a great deal of fun, and in the end, like Rebecca mentioned, it was illuminating how much of the trappings of the Church could be folded into the mythology of vampirism. Rebecca - All of them at once, I think. We had already created the supernatural world and the characters that inhabited it, so for the second book we wanted to venture further afield in that world and more deeply into the psyches of the characters. Jim - It certainly had to be all worked out as a whole, almost like a jigsaw puzzle, every piece had to be examined and turned until if fit just right. We thought this was important so that the paranormal elements of the story didn’t overwhelm our characters. Though this series deals with immortal beings and creatures both light and dark, we didn’t want to lose that exploration of the human condition. To touch a reader emotionally, the story and characters must be accessible and relatable. To achieve that required all the elements of the story to work in harmony and as a whole tapestry. Rebecca - I answered this one early, didn’t I? Sorry about that. The characters had some intense experiences in the first book, especially Erin, and that leaves a mark. She realized that everything she thought she knew was incomplete—monsters existed in the world and had been leaving their mark on history for thousands of years. This shook up her intellectual worldview, and I think she’s still grappling with it. Plus, of course, the nature of her relationships with Jordan and Rhun changed a lot in the first book, and that makes all of their interactions more complex and emotionally charged. A: Jim - Exactly. I always dislike books where characters escape great peril with barely a scratch and have no lasting effect. They get shot in the shoulder on page 4 and are perfectly fine by page 6. And it’s not just the physical aftermath, but the emotional aftermath of such trauma. That’s something we explored deeply in this second novel. Everyone was drastically changed by events in the first book, surviving a trial by fire. Now they have to put their lives back together, while facing a new and even greater threat. 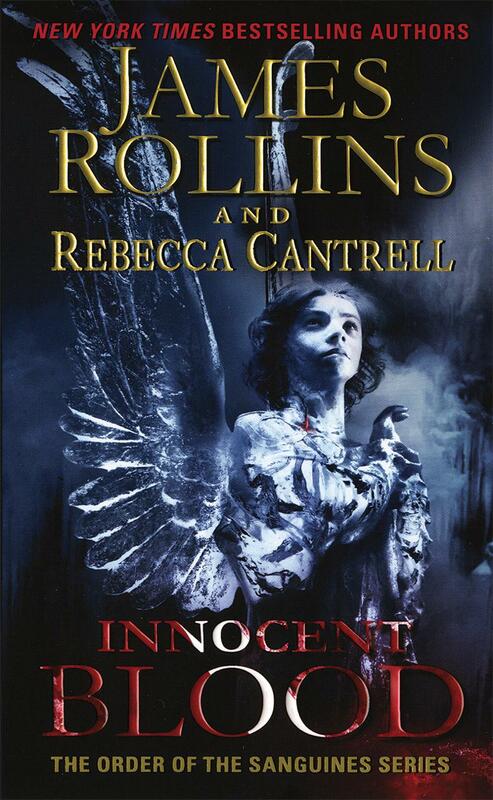 Rebecca - I don’t want to give too much away, but the forces unleashed at the end of INNOCENT BLOOD must be battled, and the power contained in both good and evil blood will not be easily contained. Jim - Yes, there are some huge surprises in store both for the characters and for our readers. Some of them even shocked us. Then again, when you’re dealing with the apocalypse, no one should be safe. Jim - The seed for this series came during a trip to a museum in Los Angeles, where I found myself staring at Rembrandt’s painting of “The Raising of Lazarus.” It’s a macabre and dark imagining of this miracle of Christ, and it struck me strange how scared everyone looked in the painting. This moment started me down a road of reflection about early Catholicism, vampirism, and a story began to unfold, a story that examines the line between faith and science. I knew this could be a huge and groundbreaking new mythology, a story so epic in scope that I knew I didn’t want to tackle this alone. Rebecca - I met Jim at the Maui Writer’s Conference just before my first novel, A Trace of Smoke, was published. He was my instructor in a thriller-writing course and we kept in touch after that. I’d just put the finishing touches on my fourth novel when he called me out of the blue about this series with vampires who live on transubstantiated blood. We spent a long time on that call talking about the world of the Sanguinists and the strigoi. We had very similar visions of that world, and could see what we each would bring to it. The writing process involves a lot of talking on Skype, rewriting, and driving each other generally crazy. Fill out the form below to create a review for innocent-blood-the-order-of-the-sanguines. Your review will have to be approved first before it will show up on the site.